Welcome to part II of this year’s Easter special. While yesterday you got to know Moses, one of the many people whose life was changed by CoRSU, I would like you meet Moses today, the head of the prosthetic unit at the centre. I am Kaweesa Moses, a prosthetist and orthotist by training. I am the head of 3-D Printability Research and team leader of the Prosthetics Unit with the Comprehensive Rehabilitation Hospital Uganda (CoRSU), where I have been for the last nine years. What Does Your Average Day Look Like At CoRSU? That depends, but I am usually here every day by 7:00 am to make administrative reports and plan the team deliverables for the day. I carry out ward rounds to monitor the progress of all the in-patient clients we have within our unit. I join the surgeons to plan and give feedback on rehabilitative processes and assistive devices for the amputations due and done respectively. What Inspired You To Do This Kind Of Job? That has been a personal journey. My older brother lived with disability, having lost both limbs due to the 1986 bush war that brought the current government of Uganda into power. Over the years I saw him struggle with disability, acceptance and fulfillment. It hurt to see my own struggle. We grew up with our mother most of the time, but due to several constraints, we had to be taken to our grandmother. I had made a childhood vow to him that I would make him a legs to help him walk. While in school, Christian missionaries once visited and I saw one of them with an artificial limb. I was so impressed. I decided then that was my life path. I went to university and opted for a diploma in prosthetics and orthotics. Unfortunately, I lost my brother before I graduated. A fire broke out in his house one day. He couldn’t save himself out and that is how he met his tragic death. His death spurred me on to help others even though I would never fulfill my promise to see him walk. To me, every day I see a patient walk again, undergo rehabilitation and get assistive devices, I feel my brother smiling back at me. Why Did You Choose To Work At CoRSU? I graduated from university in 2007 and got an offer with a rehabilitation center in town where I stayed for three years. When CoRSU opened in 2009, I needed a new challenge and I was offered the role out of ten other candidates. On An Average Day, How Many Patients Do You See? We can see 10 to 15 patients usually. Our peak days are mainly school holidays where we have between 30 and 40 patients. Over 80% of these are children. How Do You Rate CoRSU’s Workshop Compared To Other Workshops In The Country? I have had chance of traveling around the country visiting different orthopedic workshops especially those run by the Government of Uganda. There are not many private workshops. Those run by government have not been fully functional. If you find a workshop producing prostheses or artificial limbs they are not doing other devices like orthoses. CoRSU is one of the best currently in the county because we offer a comprehensive package, we embrace research, we use lamination technology and 3-D technology. 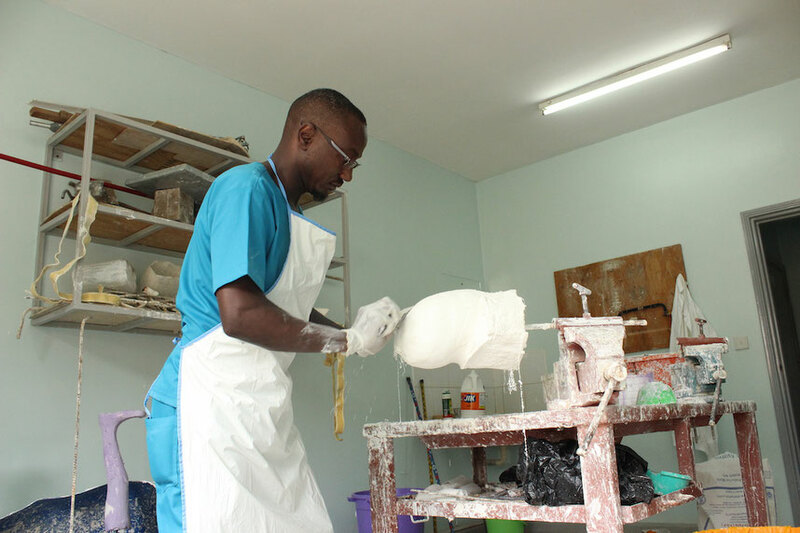 I stand corrected, but I cannot think of any other orthopedic workshop in Africa that used 3-D printing technology with the ability to produce the full spectrum of all kinds of devices. Guest post by the team from CoRSU Hospital in Uganda. If you want to learn more about them and their incredible work, check out their homepage or follow them on Facebook or Youtube.